The nostalgic design of this popcorn maker looks great hanging hearthside, but its not just a decorative piece. This popper makes two quarts of popcorn at a time. Also works great for chestnuts. Made from stamped steel with bbq grade baked enamel finish. Our popcorn maker creates tradition with this healthy, safe and affordable way to get the family together on movie night. Kernels from your garden or the local farmer’s market,some butter and salt or maybe something sweeter like cinnamon and sugar. Features a quality wood handle, with a leather hanging strap. Handle and rod unscrew for easy storage when car camping. 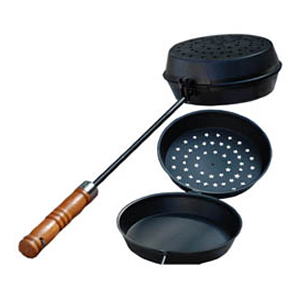 Works great in your wood fired oven, campfire or bbq grill. 3 1/2 ” depth x 9″ diameter.